If you want to scare yourself rigid, pop along to Clanage Road roundabout on any weekday in term time at 3.15pm. That’s the time that 1,500 kids pour out of Ashton Park School and onto the fast busy roundabout on the A369. This is a key hub on the F11 Inner Orbital Cycling Freeway in the BCyC strategic cycle network and close to F8 Festival Way Quietway. BCyC members have been working with local residents on ideas to improve walking and cycling and the junction has been adopted as one of the priorities for the Greater Bedminster Community Partnership (see TrafficChoices tracker). A paper making the case for change is here: Clanage-Road-Roundabout-Strategic-Route-hub-proposal-May-2015. This has been presented to the local neighbourhood partnership, GBCP, and is based on a series of raised tables, crossings and improvements to reduce the speed of the estimated daily flow of 10-20,000 vehicles. It also aims to significantly increase the number of cycle movements from the current 1200-2000. This proposal would certainly improve the situation but it won’t create the pleasant experience for walking and cycling that has been called ‘Dutch standard’ or Space for Cycling. Might a better solution be to change the geometry of the junction to reduce speed, balance priorities, and increase capacity for walking and cycling, as in the illustration on the right. As always, the key issue is how to balance a proper long term solution to the underlying problems, against what might be a more deliverable ‘work around’ that addresses the worst of the issues. 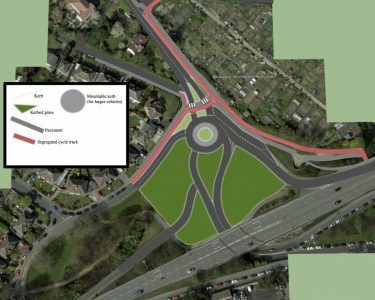 We understand that at some stage there will need to be major changes to the Brunel Way bridge, and there are also likely to be major developments in the area, including of the UWE Bower Ashton site. These will perhaps enable a ‘proper job’ at this junction. Also one of the options for the Ashton Court missing link is down Blackmoors Lane and across this junction, but it’s not the best route. In the meantime is it better to do something than nothing? Or does some minor mitigation make real change less likely? Reduce the heady mix of ambiguity and conflict for residents, walkers, cyclists and drivers. The conflict is principally between vehicle drivers who seldom yield to these other road users and who approach and drive through this section at inappropriately fast speeds. Reduce the severance effect of A369 on residents living at Bower Ashton. Read this interesting comment from one of our members about this proposal Achievable or Ambitious: What should BCyC campaign for?